Hemoptysis is the expectoration of blood. Massive hemoptysis, which occurs in approximately 5 percent of all cases, is often a sign of a serious underlying medical condition that constitutes a medical emergency. The definition of massive hemoptysis may vary from 100 ml over 1 hour to up to 600 ml in 24 hours. Hemoptysis resulting in a transfusion requirement or hemodynamic instability is also considered massive. The mortality rate in massive hemoptysis is as high as 75 percent with death resulting from acute airway obstruction and hypoxemic respiratory failure, rather than exsanguination. Since total airway dead space measures approximately 150 ml, the conducting airways may become obstructed with even minimal bleeding if a patient is unable to clear blood effectively. Hemoptysis is generally considered either massive or sub-massive. Massive hemoptysis is broadly defined as production of 500-600 ml of blood over 24 hours; 100 ml within 1 hour or bleeding necessitating transfusion or causing hemodynamic compromise. Are you sure your patient has hemoptysis? What should you expect to find? Hemoptysis often presents as a cough with accompanying expectoration of blood or blood-streaked sputum. Some patients note “gurgles” or “rattles” in their chests before hemoptysis begins with or without cough. Epistaxis and hematemesis are two common disorders that may mimic hemoptysis. Patients may be unable to differentiate among the various potential bleeding sources. If epistaxis or hematemesis cannot be excluded, consultation with an otolaryngologist or gastroenterologist may be warranted. How and/or why did the patient develop hemoptysis? When a patient presents with massive hemoptysis, several major etiologic categories should be considered as diagnostic and management plans are implemented. Which individuals are at greatest risk of developing hemoptysis? A detailed history and physical examination may provide initial clues regarding the underlying etiology. Physicians should elicit any recent symptoms of infection. Particular attention should be focused on eliciting any underlying lung or cardiac disease, occupational or tobacco exposures, connective tissue disease, and family history of lung disorders or bleeding disorders. Initial laboratory tests should include a complete blood count, coagulation studies, blood urea nitrogen, creatinine, and urinalysis. These results may provide clues as to the presence of any underlying systemic disorders (e.g., coagulopathy, autoimmune pulmonary-renal syndromes). Serologies (ANA, rheumatoid factor, ANCA) should be evaluated for a suspected pulmonary-renal syndrome. Sputum and blood cultures may be performed to look for pathogenic organisms when an infectious source is suspected. What imaging studies will be helpful in making or excluding the diagnosis of hemoptysis? Radiographic studies form the backbone of the diagnostic evaluation in massive hemoptysis. The goal of imaging is to help identify and localize the potential cause of bleeding and intervene if possible. The standard chest radiograph (CXR) is an important initial tool that may identify a number of pathologic entities, including cavitary lesions, tumors, lobar or alveolar infiltrates, pulmonary infarcts, and mediastinal masses. However, the false-negative rate of the standard CXR may be as high as 40 percent. Computed tomography (CT) greatly enhances the capability of diagnostic imaging based in its enhanced sensitivity over standard chest radiography. CT may detect nodules, masses, cavitary lesions, infiltrates, and mediastinal adenopathy that might be otherwise missed on the CXR due to its low resolution. Contrast-enhancement may detect pulmonary emboli, arteriovenous malformations (AVMs), or aneurysms. Moreover, multifocal CT abnormalities may help identify bleeding laterality. Two major limitations of CT imaging are the time required to obtain the study and the need for supine positioning of the patient, which may impair airway clearance with ongoing bleeding. Therefore, in rapidly-progressive, life-threatening hemoptysis, definitive intervention should not be delayed for purposes of obtaining a CT.
What non-invasive pulmonary diagnostic studies will be helpful in making or excluding the diagnosis of hemoptysis? Hemoptysis is generally an acute, anxiety-provoking event, therefore most patients present to their primary care doctor, pulmonologist or nearest emergency department for evaluation early in their course. Laboratory, radiographic, and bronchoscopic evaluations are usually undertaken in the emergency department or in another monitored setting such as the intensive care unit. What diagnostic procedures will be helpful in making or excluding the diagnosis of hemoptysis? Fiberoptic bronchoscopy is an important procedure to consider in identifying the source of hemoptysis when it is unclear from radiographic studies. The overall goal of bronchoscopy is identification of the bleeding site so that definitive interventions may be performed should bleeding persist or become life-threatening. If the source of bleeding is unclear and an upper airway or gastrointestinal source suspected, nasopharygolaryngoscopy or esophagogastroduodenoscopy may be performed. 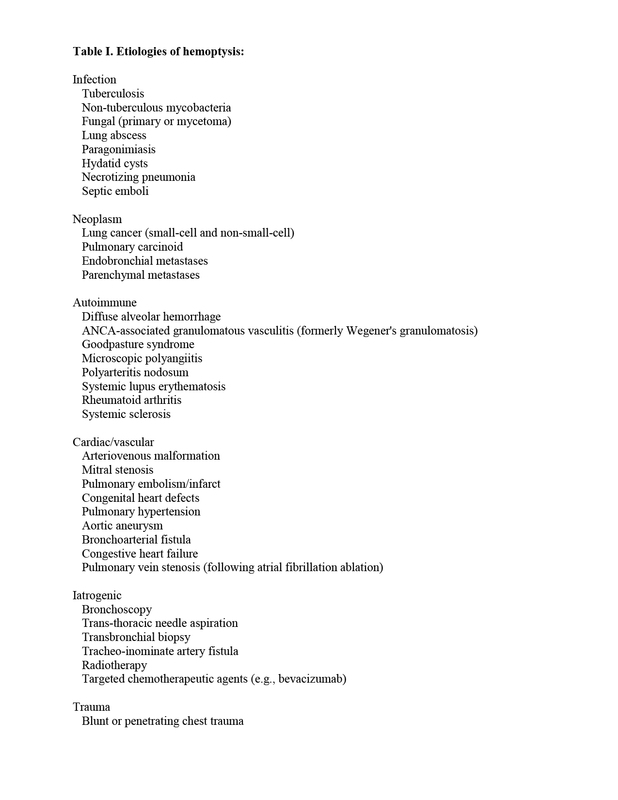 What pathology/cytology/genetic studies will be helpful in making or excluding the diagnosis of hemoptysis? If primary bronchogenic carcinoma is believed to be the source of hemoptysis, sputum cytology may be sent. However, in contemporary thoracic oncology management, diagnosis alone is insufficient to inform lung cancer management and all patients should be considered for complete non-invasive and minimally invasive staging with CT, PET and nodal sampling. If you decide the patient has hemoptysis, how should the patient be managed? The initial steps when a patient is experiencing massive hemoptysis include stabilization. Establishing an airway, ensuring adequate ventilation and circulatory stability are essential. The first intervention considered in an acute bleed is simply to turn the patient bleeding side down to keep from soiling the unaffected bronchial tree. Allowing the patient to clear his or her own airway is more effective than any mechanical intervention. Patients should be admitted to and monitored very closely in an intensive care unit (ICU). Endotracheal intubation should be considered if a patient cannot clear the bleeding or if the patient develops progressive respiratory distress or hypoxemia. Intubation with large-bore endotracheal tubes (e.g., 8.5 or 9 mm diameter) is recommended to facilitate suctioning and to allow bronchoscope insertion. If the patient has ongoing large-volume hemoptysis, the endotracheal tube can be advanced under direct bronchoscopic visualization into the non-bleeding airway. The blood can be aspirated and the patient stabilized. Alternatively, an endobronchial blocker can be placed. Two techniques have been described including looping the catheter around the tip of the scope and advancing the flexible bronchoscope and catheter en-bloc into the airway. The other approach is to pass a forceps through the working channel of the bronchoscope and then grasp the loop, advancing the system en-bloc into the bleeding airway. The balloon should be advanced as distally as possible to minimize the lung excluded from ventilation. The balloon should be deflated every 24 hours to verify whether the bleeding had ceased. Bronchoscopy should be considered at this point. This allows for localization and endoscopic intervention is appropriate. Rigid bronchoscopy allows simultaneous large-bore suction, airway maintenance, and ventilation, so it is the preferred modality in life-threatening hemoptysis. However, the effectiveness of rigid bronchoscopy can be limited by physician experience and inability to access beyond the trachea and mainstem bronchi. Consequently, rigid and flexible bronchoscopies are often combined to achieve optimal bleeding evaluation and control. Bronchial artery embolization (BAE), which was first performed in the 1970s, has become the non-surgical treatment modality used most often because of its effectiveness on both a short-term (over 90%) and long-term (over 80%) basis. Successful embolization depends largely on the ability to delineate the vascular anatomy angiographically. In patients with recurrent bleeding despite embolization (10-20% over six to twelve months), repeat embolization can be attempted. Patients with lateralized, uncontrolled bleeding should be assessed early for possible surgery in case they prove to be refractory to temporizing measures or BAE. Surgical intervention is usually the treatment choice in massive hemoptysis cases that are due to leaking aortic aneurysms, hydatid cysts, iatrogenic pulmonary vascular ruptures, or chest trauma. However, surgery is contraindicated in carcinomatous invasion of the trachea, mediastinum, heart, and great vessels and in advanced lung fibrosis. The surgical mortality rate in massive hemoptysis (defined as death within seven days postoperatively) ranges from 1 percent to 50 percent, with emergent cases having the highest mortality rate. Common surgical complications include empyema, bronchopleural fistula, postoperative pulmonary hemorrhage, prolonged respiratory failure, wound infection, and hemothorax. Recently, some centers have demonstrated reduced mortality by avoiding surgical intervention within 48 hours from onset of hemoptysis if bleeding can be temporized with less invasive measures. Late re-bleeding (past one year) is usually due to neovascularization or recanalization. BAE complications are uncommon in experienced hands, but bronchial wall necrosis and ischemic myelopathy from inadvertent spinal artery embolization can occur. The prognosis for patients with life-threatening hemoptysis depends on two factors: the ability to prevent acute asphyxiation from airway obstruction and the underlying etiology. In patients in whom massive hemoptysis is controlled and for whom the hemoptysis is found to be due to an underlying, treatable pulmonary or systemic condition (e.g., infection, pulmonary-renal syndrome, or septic emboli), the prognosis is good. In contrast, in patients who have significant hemoptysis and untreatable or advanced diseases (e.g., lung cancer or metastatic pulmonary lesions), the prognosis is poor. What other considerations exist for patients with hemoptysis? In patients with arteriovenous malformations and hemoptysis from hereditary hemorrhagic telangectasia, genetic screening and counselling may be important considerations for patients and families.